Dimensional Robo’s newest commander is now officially revealed. 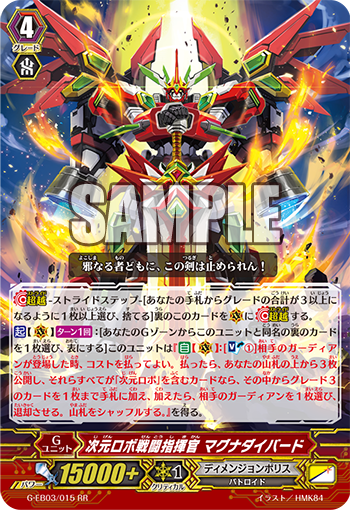 ACT (VC) 1/Turn: [Choose 1 card in your G Zone with the same name as this card, flip it face-up] This Unit gains “AUTO (VC): [Soul Blast 1] When your opponent places a Guardian on the field, you can pay the cost. If you pay it, reveal the top 3 cards of your Deck, and if all of those cards are “Dimensional Robo” cards, add up to 1 Grade 3 card among them to your hand. If you add 1, choose 1 of your opponent’s Guardians, Retire it. Then shuffle the Deck.”.